Your Car Weighs Up to Two Tons. A Cone Won’t Slow it Down. Your Right Foot Will. Three Simple Acts Can Save a Worker’s Life. Slow down and drive with extreme care near a Cone Zone. Think about every cone as if a human being were standing behind it. Plan your route and allow extra travel time. Expect the unexpected and don’t tailgate. Slow down to posted speed limits and pay attention. Allow extra space between your vehicle and the one in front of you. Never use a cell phone or text while driving. Follow sign and flag directions. Get to know the work zone signs. Keep your cool and be patient. Slow down even if you don’t see anyone working. Hazards such as traffic shifts or lane reductions may appear suddenly. Use these promotional materials to promote the Slow Down and Move Over message within your workplace or community. Take the roadside safety quiz. 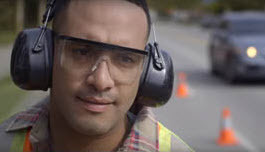 It’s a fun way to test your knowledge about how to drive safely in roadside work zones. The real story. Learn more about what it is like to work in a Cone Zone.